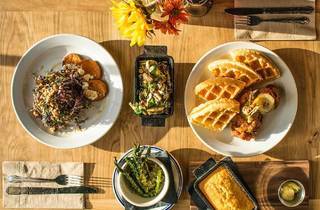 At this wood-paneled chicken-and-waffle den, the soul-food staple gets a chefly update: Organic poultry is deep-fried and served atop flavored Belgian-style waffles (bacon and cheddar, rosemary and mushroom). Along with the namesake dish, carnivorous chow covers the communal picnic tables, like roasted pork tenderloin and dry-aged rib eye, and humble sides such as mustard greens, pickled watermelon rind and homemade buttermilk biscuits. Keeping up with the rustic-meets-refined spirit, the reclaimed wood bar offers tipples like a house-infused watermelon vodka martini and a classic rye Manhattan. I’ve been coming here for years, and I’ve loved it just as long. 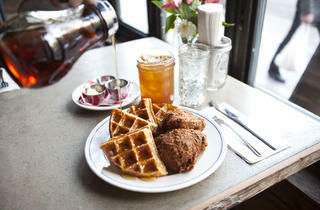 The chicken is crispy and flavorful, and the waffle is light and sweet. The different butters are all great, and the mac and cheese is creamy and delicious! The shells are different, and I think it’s way cool. The wait for a table might be long, but it’s always worth it. Came here with friends after hearing about this place. I was told the chicken and waffles are one of the more popular dishes, so I went for it.Let me tell you, I was not disappointed in any way shape of form. The chicken was moist and crisp, while the waffle was made exactly to my liking, not to tough, not oily, just chewy enough. I recommend this place just for the chicken and waffles if you ever have the urge. Love that its "all inclusive" in LifeStyle acceptance! I've been here once for brunch and it was good. The Chicken and waffles were spot on, as were the grits, sausages and gravy. It get's really busy in warmer months due to it's location right in the middle of Williamsburg, and although it's great, I would probably not recommend waiting, and would suggest going to one of the many other awesome places nearby. Sweet chick is a solid fried chicken spot. Not the best I've had in the city but really really good! 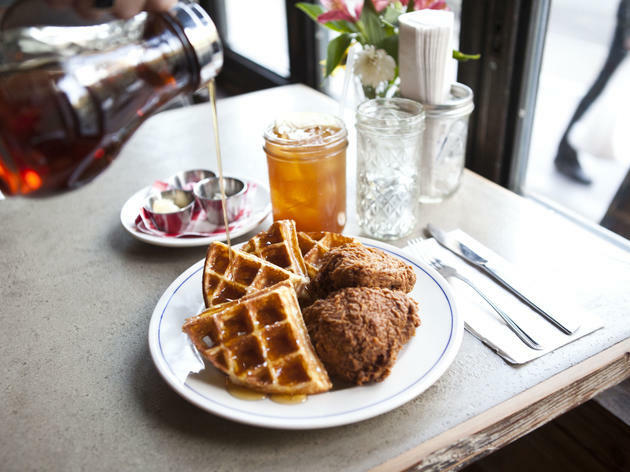 Worth stopping by if you're looking for a delish chicken and waffles brunch in Williamsburg. Whenever I'm trying to sell somebody on Brooklyn Brunch, I take them here. The brunch options are traditional (nothing too out of the ordinary for a place on Bedford Ave) but everything is very well-executed and delicious. The Black Bean Cakes are to die for (especially if you want a non-egg, non-meat brunch option) and the cheddar grits rival the best you'll find in Tennessee. Be careful of visiting Sweet Chick when you’re in a rush, however. The service can be fairly slow and the wait for a table can be up to an hour. Honestly, I just didn't think Sweet Chick was all that it was cracked up to be. After going once, I never feel the need to go again. I've had much better chicken and waffles at other places. If you go to the one in Williamsburg, you'll be waiting at least an house for brunch on weekends. But, if you're looking for a standard Southern-style breakfast, you can get it here. There are no surprises. I will say, stick to the standard options and don't order the single Mexican-inspired option they have on the menu like my friend did. All in all, a perfectly adequate place with a great location on Bedford in Williamsburg. I am what you call a believer--a believer that a merry wedding of sweet and savory is the ultimate and unquestionably perfect union. So when you bestow upon me such an immaculate concoction such as Sweet Chick's chicken and waffle--there is no greater bliss that can be experienced by any man. Their bacon & cheddar Waffle is hands down, the best waffle I've ever had. So good, that I bought a second one to-go, which I later forcibly shoved into my boyfriend's mouth despite his protests that he had just eaten. Their bacon cheddar waffle is moist and fluffy--the most necessary elements in a perfect waffle. Their fried chicken is crispy and succulent--drizzled with their genuine maple syrup, it's enough to make a believer out of any man/woman/reluctant significant others. 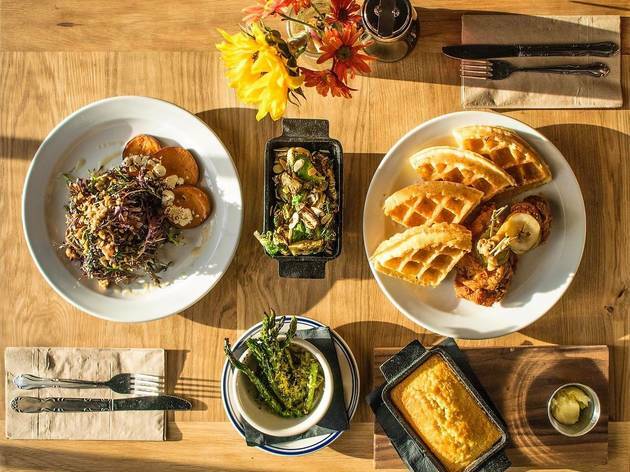 Wash this merriful union down with one of Sweet Chick's worthy drafts, and if you're still hungry, dig into some of their duck confit sliders--which are tasty, that is--if you aren't tempted to order another waffle.